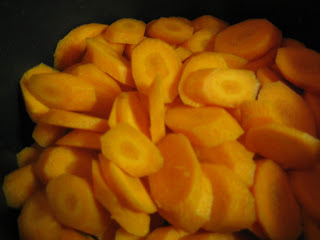 I decided that I would make a big batch of carrot coins - then freeze them in little batches to reheat as a side-dish for dinners...Green Giant has nothing on me. Once everything was in the pot, I brought the liquid to a boil, then covered and reduced to a simmer. 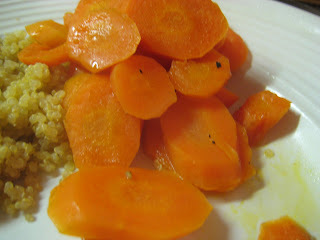 This cooked until the carrots were tender and the liquid reduced slightly to create a glaze. This made a TON - so I froze them in little 1 cup containers for easy re-heating. Thanks, Alicia! This is great...can't wait to try at home! I like the maple syrup. I always use brown sugar and cinnamon, and butter. :) I will definitely try this. Alton Brown told me that freezing peas in batches will outsmart the green giant as well! oh. and nice Serious Eats post yesterday! Sounds really good- going to try this tonight instead of the same old! Amanda Nicole, thanks for the comment! love your challenge! Best of luck - I'll be reading!